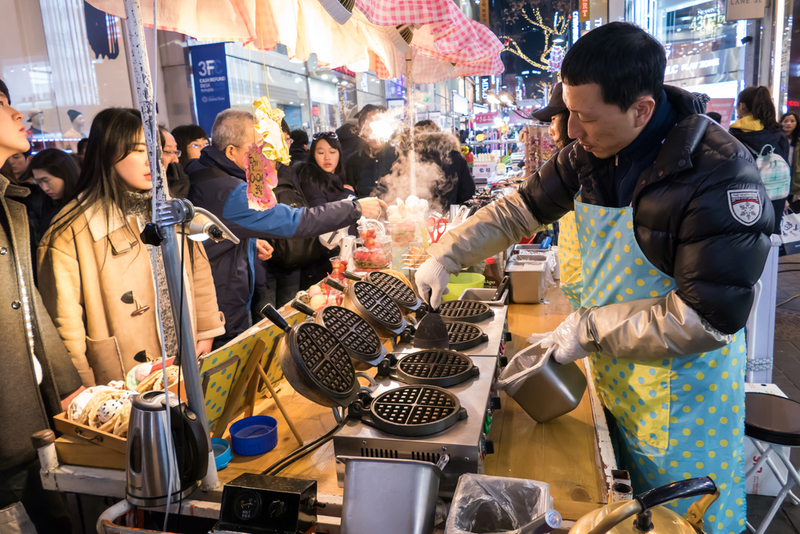 Seoul is home to some of the only markets in the world that actually get busier late at night, with stalls typically opening around 11pm and the best action happening around 2 or 3am. There’s something inexplicably invigorating about shopping in Seoul in the middle of the night with thousands people. It feels like you snuck out of the house to go to a party your parents strictly forbade you from attending. Most stores close down around 5am, which is enough time to get a nap in and still wake up with a full day to explore. Seoul is the city that never sleeps in the most literal sense. 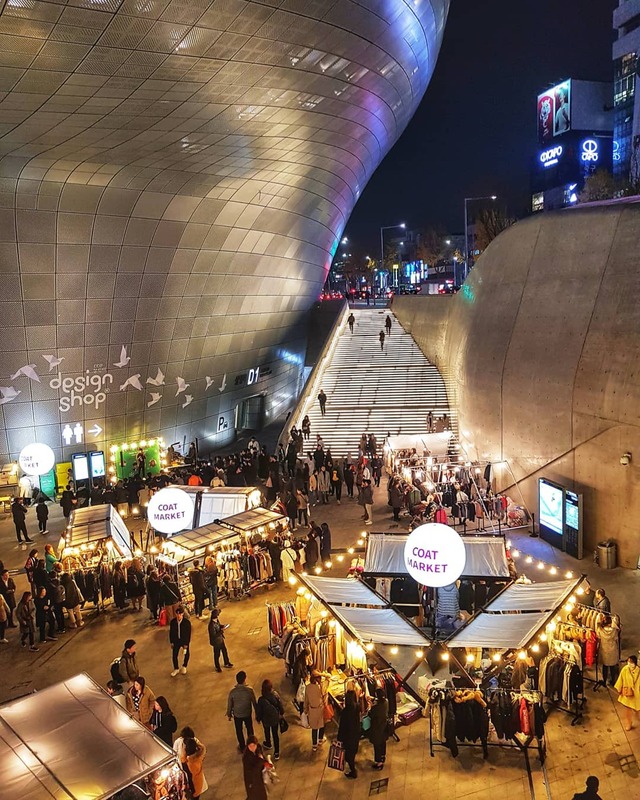 Miglore, Hello apm, Doota Tower, Pyounghwa Clothing Market, and Kwanghee Fashion Mall are some of the must-hit shopping malls in Seoul. A good plan of attack is to start on the top floor and work your way back down to the exit. Each mall is a labyrinth overflowing with small vendors selling every item of clothing you’ve ever thought about putting on your body (and a whole lot you never knew existed!). When you’ve shopped your fill at each of the malls, wander down any side street or alley you pass by. These are cluttered with pop-up stalls. The yellow tents near the Dongdaemun History and Culture subway station are also worth wandering through — but come prepared, cash is king in the yellow tents. 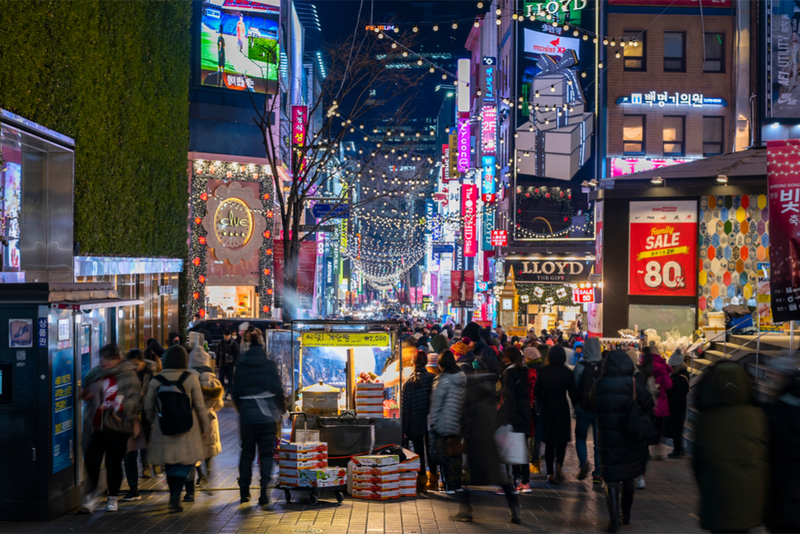 Most vendors in the Dongdaemun market area specialize in wholesale, but they will sell retail as long as you buy a few pieces or the same piece in a few colors. The entire night shopping scene here revolves around local designers and manufacturers. The factories are up the street from the malls. This creates a unique opportunity for the designer to send a product to the factory in the afternoon and have it on the rack for sale the next morning. Move over Harajuku girls — Seoul is now the queen. As you navigate the maze of shopping, you’ll feel like you’re somewhere you definitely shouldn’t be as hand trucks loaded up with white bags overflowing with clothing whizz by in the small corridors. Since wholesale is the name of the game here, these clothes are heading all over Seoul, to other parts of the country, and a whole bunch are being shipped abroad. Many store owners in Thailand, China, and Japan frequent this area to scope out current fashion finds. New merchandise comes out daily, not the norm in this type of industry. So if you want to be the most fashionable in your friend group, you’ve come to the right spot. If you need any extra help with what’s currently in vogue, you’ll be shopping in the company of Seoul’s best dressed, so this is an ideal people-watching area to hang out in. And in five years, you can mock all of your friends for being late to the party once the U.S. finally catches on to some of the trends Asia is already totally done with. In front of the malls and down every side street is food heaven. Within just a few hours, you’ll find every type of food you came to Korea for. Tteokbokki — spicy rice and fish cakes drowning in red pepper paste — is a staple here and found under every red tent, most with standing room only. 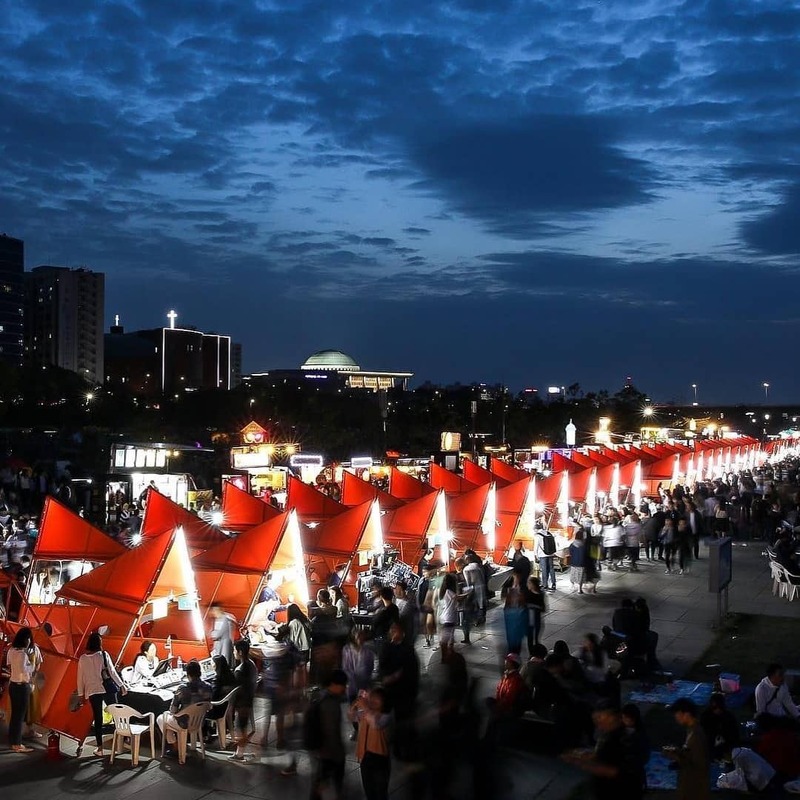 Most red tents will also have soondae, Korean blood sausage, which is way more delicious than it sounds. 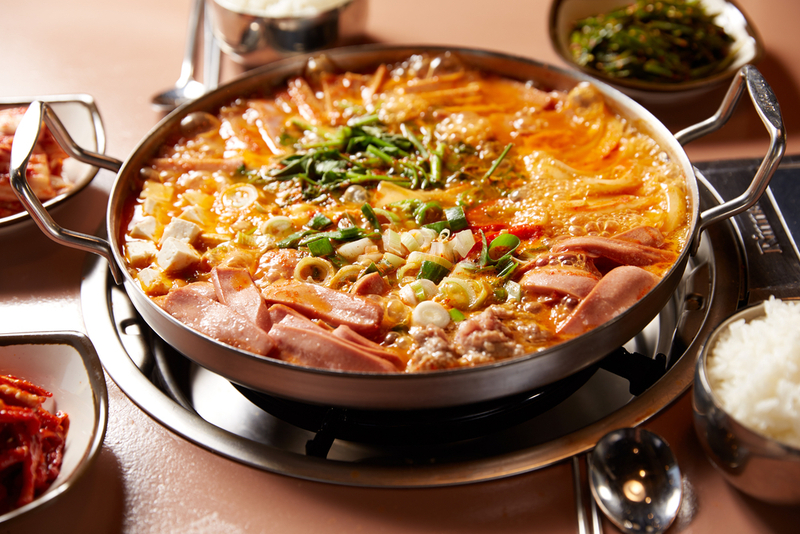 Pop into any of the restaurants nearby for kimchi jjigae, kimchi stew, or try my absolute favorite Korean dish, budae jjigae, army base stew. Budae jjigae took hold during reconstruction from the Korean War. It’s a glorious mix of American food that was found on military bases with traditional Korean flavors. The stew features Spam, sliced hot dogs, baked beans, ramen noodles, kimchi, spicy red pepper paste, tofu, and green onions. It’s all assembled and cooked in front of you at your table. The final elegant touch that screams “America” is a few slices of processed cheese draped over it all, imparting its unmistakable fake cheese flavor throughout the dish. It’s quintessential Korean cuisine with deep historic roots. Budae jjigae, Seoul, South Korea. If you’re just looking for a quick bite, lighter fare is around, too. Ediya Coffee (think the Korean version of Starbucks) is open until 4am. Convenience stores are all over and most have seating areas in the front of the store for people-watching with a snack or a beverage. If you’re over shopping but still want to experience the energy of Seoul, take a short walk over to Cheonggyecheon. The city spent $281 million to create this creek that is almost seven miles long and runs through the heart of the city. It’s a stunning aspect of Seoul that used to be a freeway. It’s the perfect ending to the perfect pre-dawn shopping spree in Seoul.